I wanted here at leisure to crochet a child a toy. The basis of this toy was to be a ball. 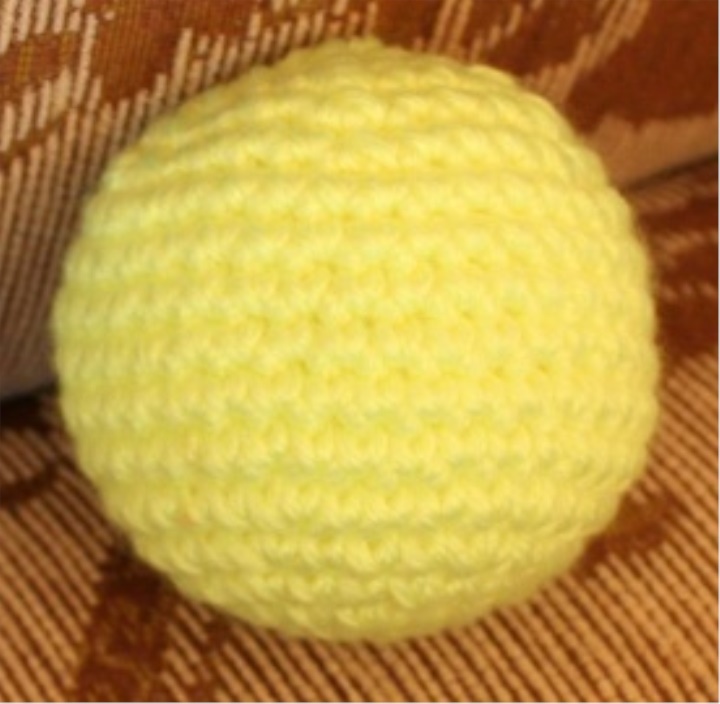 And I was faced with the problem of finding the crochet scheme for a smooth ball. 1 row: dial 2 air loops, closes the ring. In this ring provyazyvaem 6 columns without nakida. 2 row: be sure to mark with a contrast thread the beginning of the row! Knit in each column of the previous row 2 columns without nakida. It turns out 12 columns. 3 row: we Like a Star @ heaven knit 2 columns without single crochet into one column of the previous row, then 1 column without single crochet into 1 column of the previous row. From Like a Star @ heaven repeat 6 times. It turns out 18 columns. 4 row: Like a Star @ heaven increase, 2 columns without nakida. From Like a Star @ heaven repeat 6 times. It turns out 24 columns. 5 row: Like a Star @ heaven increase, 3 columns without nakida. From Like a Star @ heaven repeat 6 times. It turns out 30 columns. 6 row: Like a Star @ heaven increase, 4 columns without nakida. From Like a Star @ heaven repeat 6 times. It turns out 36 columns. 7-12 rows: 6 rows knit exactly, without increments. 13 row: Like a Star @ heaven decrease, 4 columns without nakida. From Like a Star @ heaven repeat 6 times. It turns out 30 columns. 14 row: Like a Star @ heaven decrease, 3 columns without nakida. From Like a Star @ heaven repeat 6 times. It turns out 24 columns. 15 row: Like a Star @ heaven decrease, 2 columns without nakida. From Like a Star @ heaven repeat 6 times. It turns out 18 columns. 16 row: Like a Star @ heaven decrease, 1 column without nakida. From Like a Star @ heaven repeat 6 times. It turns out 12 columns. 17 row: 6 down. It turns out 6 columns. Pull the resulting hole with a needle. And I’ll open a little secret: According to this scheme, you can knit balls of any size, you just need to make 6 increments in each row evenly, then knit evenly, then in each row you can evenly reduce 6 times. And counting the number of rows that need to be knit exactly, so that the ball turned round is very easy! It is necessary to divide the number of bars in the last row with increments by 6! It turns out the number of even rows.